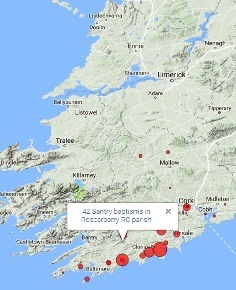 Genealogist John Grenham’s Irish Ancestors site has developed a Catholic baptism mapping service, which shows the numbers of baptisms of a particular surname in each Catholic parish overlaid onto a Google map of Ireland. You can see, right, a map of Santry baptisms. Darn clever! John told Irish Genealogy News: “It’s based on FindMyPast’s transcripts of the National Library microfilms, which they generously shared with me. It has all the flaws of the microfilms, in particular the 1880 cut-off point, and of course the inevitable mistranscriptions, but I think it gives a useful bird’s-eye-view of what families were recording baptisms where." He calls it 'informative eye-candy'. To use the mapping service, type a surname into the box on the Irish Surnames page and click 'Go'. Like most of the site, the service is free to light users, with heavy users asked to pay a small subscription.